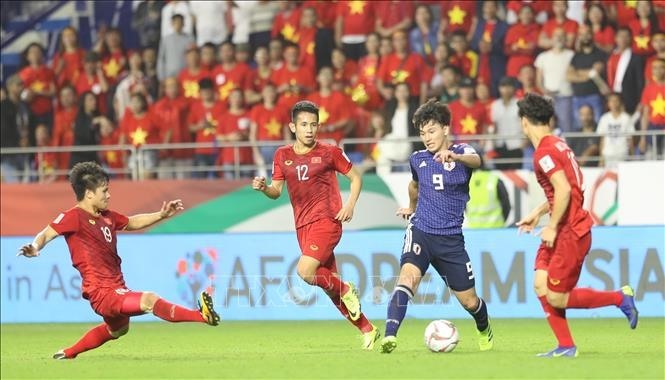 Despite losing 1-0 to Japan in the quarter-final of the AFC Asian Cup on Thursday, Việt Nam’s national squad have received applause from the international media for their performance. Both Reuters and AFP said Japan only beat Việt Nam thanks to the video assistant referee (VAR). Reuters said Japan only survived a late onslaught from the Vietnamese with Nguyễn Công Phượng in particular missing an opportunity to equalise in the 89th minute when he found himself unmarked just outside the box but blasted over. The World Game of Australia said Japan were lucky to reach the semi-finals thanks to VAR. “Japan benefitted from a contentious VAR penalty decision on the system’s AFC Asian Cup debut as a 1-0 win over Việt Nam proved enough to see Hajime Moriyasu’s men reach the semi-finals,” said theworldgame.sbs.com.au. “Their fairytale run into the quarter-finals of the AFC Asian Cup 2019 might be over, but for Việt Nam, the only way is forward. After reaching the final of the AFC U-23 Championship 2018, semi-finals of the Asian Games 2018 and winning the AFF Suzuki Cup 2018 last year, the Golden Dragons have now shown the world that they can compete among the elite of the sport. With age on their side, it looks like the future is for them to own. If Park can continue working his magic with this group of players, they will be a force to reckon with in Asian football in the decade to come. Well done Việt Nam for making the whole of ASEAN proud!” the website added. Sportskeeda said that Việt Nam only made the knockout stage as the final, fourth-best third-place team from the group stage and knocked out Jordan in a penalty shootout in the round of 16, but they created many difficulties for Japan. Siam Sport of Thailand said coach Park’s team are one of best eight teams in Asia.